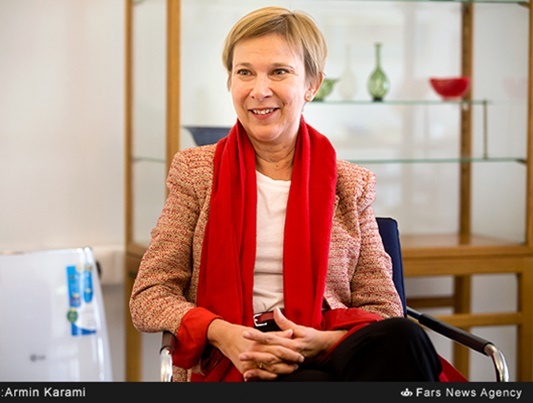 Swedish ambassador to Iran voiced her country’s willingness to hold talks with Iran on regional issues, saying Tehran should make optimum use of its influence to settle the ongoing crises in the Middle East. Sweden’s new ambassador to Tehran, Helena Sångeland, believes her country and Iran can contribute to the Middle East’s greater security and stability through bilateral talks. In a Farsi interview with Fars News Agency, Sångeland said in addition to their economic cooperation, Iran and Sweden can hold talks on regional issues. Elaborating on the Saturday visit of Sweden’s Prime Minister Stefan Löfven to Iran, she said he is accompanied by the country’s Minister for EU Affairs and Trade at the Ministry for Foreign Affairs Ann Linde, managing directors of about 20 private companies as well as the officials of a number of state-run firms and universities. Sångeland added Löfven is not very often accompanied by such a large delegation in his foreign visits. Commenting on her country’s trade with Iran, Sångeland said prior to the imposition of Western sanctions on Iran, Tehran was Stockholm’s most important partner in the region. “Currently, many Swedish companies ask questions about Iran’s investment opportunities and conditions. This year (2017), Business Sweden (Swedish Trade and Invest Council) will officially open an office in Tehran to prepare the ground for the presence of the Swedish companies interested in engaging in trade activities with Iranian firms or making investments in the country’s projects. Referring to Sweden’s willingness to find solutions to banking and money transfer problems in trade with Iran, she stressed that financial cooperation is of the utmost importance in the two side’s economic relations, which require greater efforts to further improve. Listing the fields of cooperation between Tehran and Stockholm, Sångeland said the two sides can collaborate in any given area. Moreover, she said, Scania AB and Volvo Group — two major Swedish commercial vehicle manufacturers, specifically heavy trucks and buses — can be of great assistance to Iran in the field of transportation. She also said that plans are underway by Sweden to resolve the obstacles encountered by Iranian planes for refueling. “This is a top priority for the Swedish government,” she added. In 2016, some 18,000 Iranian nationals applied for visa to Sweden, of which 70 percent managed to obtain one, she said. Hailing Iranian women’s greater presence in the society compared to the past, Sångeland said the Iranian society is progressing at a speed much faster than its previous pace. She stressed that more active involvement of women in social and political activities requires a favourable atmosphere. The Swedish ambassador listed the Iranian cities she has visited since taking office in Tehran (four months ago) as Kerman, Yazd, Isfahan and Chabahar port, in southeastern Iran.